Together with a team at the Erasmus Medical Center in Rotterdam, LMU researchers have developed a candidate vaccine directed against the avian flu virus H5N1 and have now carried out the first tests in humans. A vaccine directed against the avian influenza virus H5N1, has now undergone its first clinical tests. 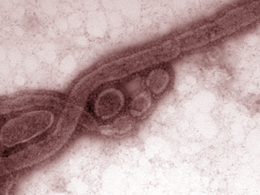 The candidate vaccine was developed by research teams led by Professor Gerd Sutter at LMU’s Institute for Infectious Diseases and Zoonoses and Professor Albert Osterhaus at the Erasmus Medical Center in Rotterdam. The results appear in the December issue of The Lancet Infectious Diseases. The vaccine is based on the use of tried-and-tested MVA (Modified Vaccina virus Ankara) scaffold. MVA was developed at LMU more than 30 years ago for use as a vaccine against smallpox, and it is used as a versatile platform for the development and investigation of vaccines targeted against diverse pathogenic viruses and cancer-specific proteins. Because the MVA genome can accommodate genes from other sources, researchers use molecular biological methods to introduce foreign genes – encoding proteins specific for other viruses, for instance. These proteins are then displayed on the surface of MVA infected cells, where they act as antigens, provoking the production of antibodies against the original source virus, in this case avian influenza virus H5N1. The aim of the candidate vaccine is to induce the immune system to produce protective antibodies that are capable of preventing infection of humans by the bird virus. The results of the clinical study show that administration of the vaccine indeed provokes a robust antibody response. In addition, the test subjects could safely be given an efficient booster injection one year after the first immunization. “Indeed, following the booster, the levels of antibodies present in the circulation increased significantly more than expected,” says Gerd Sutter. The study itself was performed at the Erasmus center in Rotterdam and involved 80 volunteers between the ages of 18 and 28, who were given two or three shots containing different concentrations of the MVA particles.